The naming of Lashkar-e-Taiyyaba, Jaish-e-Muhammad, Haqqani network, Tehrik-e-Taliban Pakistan and sundry other terror groups operating from Pakistani soil in the joint declaration adopted at the BRICS summit recently in Xiamen, China, is another blow to Pakistan’s image on the world stage. But it needs to be pointed out here that the very same terror groups were named identically in a similar paragraph in the Amritsar declaration issued at the Heart of Asia Conference last year, soon after the Uri attack. And the signatory to that declaration also included Pakistan. If one compares the two declarations, the paragraph on terrorism looks almost identical. Nevertheless, terror outfit leaders in Pakistan are worried over Pakistan’s “all-weather friend” China not backing its “trusted” neighbor on the issue of terrorism. Not only terror outfits, but most of the Pakistan media have now begun to worry over the dent in the country’s image. It was only three weeks ago that Pakistan had been crowing about its friendship with China during the Doklam standoff. The Pakistani media was singing hosannas to Sino-Pak friendship, and the Pakistani leaders were expecting China “to teach India a lesson”. But the situation has changed 360-degree within a span of 24 hours. Chinese President Xi Jinping seems to have realized that this is not the India of 1962 which can be browbeaten by shrill war cries. The Chinese leadership has begun to accept that India’s cooperation was necessary if their nation wants to dominate world economy. If terror outfits are a threat to India, they cannot be angels towards China. Chinese President Jinping has spoken about the Panchsheel principles of peaceful co-existence, but India will have to be on its guard. There is an oft-repeated observation among Indians that Chinese products are normally neither reliable nor durable. 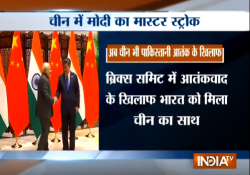 So is China’s policy towards India. On one hand, it issues the joint declaration against Pakistani terror groups and on the other hand, China refuses to acknowledge Masood Azhar as a terrorist.